Kathy has a work-study program with selected music studio students who are a great help with our farm & garden work. They get a discount on lesson tuition, and we get some extra help around the farm. I think its a great deal for all of us. Last week’s tasks kept the crew busy in the garden. Our garden continues to grow. Last week the garden crew pulled out the old lettuce and bok choy plants which had bolted with the approaching summer weather. They also weeded the potato bed and covered the emerging tubers with about 6 inches of straw. The potatoes are growing especially well–next year I’ll put in more of them! I would love to recruit a burley farm intern or volunteer who is 6′ 2″ and 200 lbs to help haul, split & stack firewood and dig post-holes! Are there any takers out there? 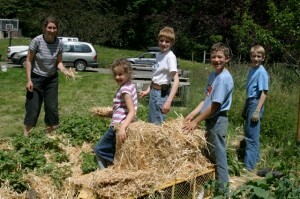 This entry was posted in Farming, Gardening and tagged Gardening, Mulch. Bookmark the permalink.